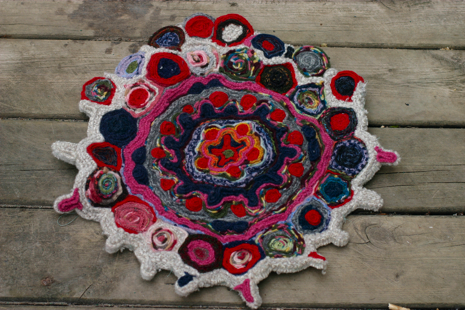 Felt Your Sweaters & Make This Rug, Paper Piecing Workshop Recap, etc., etc. 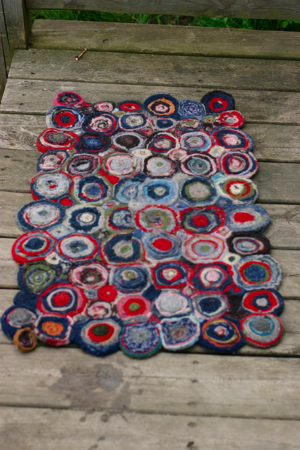 I spotted this fabulous rug made from felted wool sweaters while reporting an upcoming craft column. I’m not going to spill the beans about my featured artist before my column is published, but you can buy the pattern for the design to the left here. 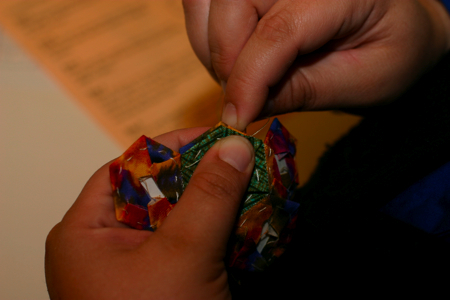 The English Paper Piecing workshop was a wild success. Somehow I hit the mark filling the room to it’s 25-person capacity without turning anyone away. I was nervous that I wasn’t going to have room for everyone who signed up, but then there were a couple last-minute cancellations and everything worked out. 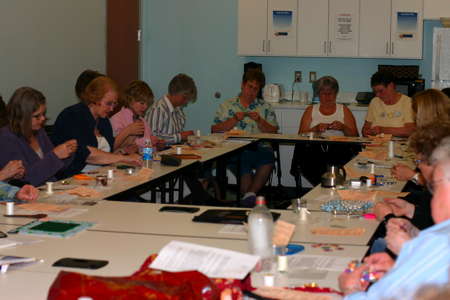 It was quite a trip to invite the public to come craft with me and actually have people show up. I met some great ladies last night and had a great time passing on my limited knowledge of this traditional piecing method. A special thanks to the nice people at Paper Pieces in Sycamore, Ill. for donating sample packs for the workshop. It’s challenging to host completely free workshops, so I really appreciated the samples. They were perfect for introducing the technique to 25 stitchers and significantly cut my prep time, which was awesome. Thanks ladies! If there’s anyone out there interested in sponsoring an upcoming craft workshop by donating fabric, yarns, hooks, needles, notions, kits or other supplies, feel free to e-mail me and I’ll let you know if I can use your stuff. I have a lot of ideas about taking my little workshops on the road and teaching people who don’t have the means to take classes at yarn shops and fabric stores, so let me know if you’d like to help me execute this plan. I’ll have to tell you about the CSA farm I joined and the Jenny Hart winners tomorrow. It’s time to hit the hay.